Emmanuel Macron’s first call after winning the French presidency was to Germany’s Angela Merkel, who “praised him for championing a united Europe that is open to the world”, according to the Chancellor’s spokesman. 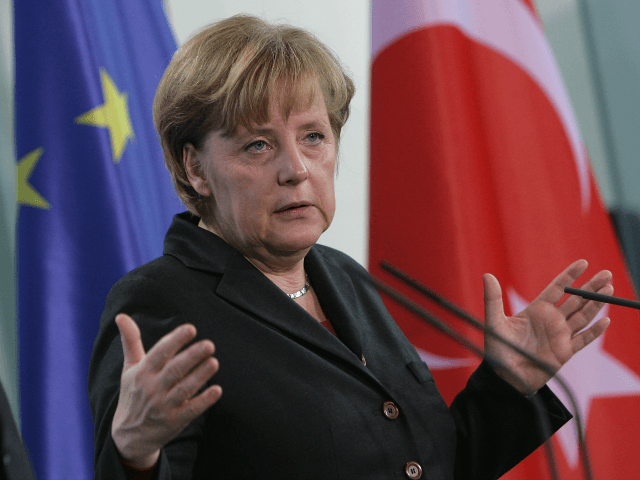 Merkel’s government has been heavily criticised after triggering a massive influx of migrants into Europe by declaring that there was “no limit” on the number of people Germany would receive. Although her commanding position at the summit of German politics remains seemingly unassailable. Macron has been a staunch defender of the chancellor’s policies, however, claiming her open invitation to migrants had saved Europe’s “collective dignity” shortly after a bogus asylum seeker from Tunisia murdered a Polish lorry driver and ploughed his vehicle into a packed Christmas market in Berlin. Consequently, the new president’s decision to call the German chancellor so soon after the result of the election drew scorn from social media. An image of the En Marche! leader at the 62-year-old’s feet – said to have been photoshopped – was circulated widely on Twitter, with many users making facetious remarks about the closeness in age between Merkel and Macron’s wife Brigitte, 64. Macron is an ardent Europhile, appearing on stage carrying an EU flag at a campaign rally and claiming that France was “a valley of tears” before the bloc came into being. He also argued that the Le Toquet agreement – which allows British officials to conduct immigration checks on would-be migrants in France, and vice versa – should be scrapped.